Noreen Marshall is the curator of the Dress, Doll, and Childhood collections at the Victoria and Albert Museum of Childhood in London. Recently, we spoke with her about the history of dolls, the various materials used and types of dolls that were made, and how dolls have evolved over time. Noreen can be contacted via the Victoria and Albert’s Museum of Children microsite, which is a member of our Hall of Fame. We have a very small team here at the Victoria and Albert Museum of Childhood, so we all have to do lots of different things. I don’t look after all the dolls, but I oversee the collections. I do the waxes and the woodens. I’ve got colleagues who are in charge of the cloth ones and the plastic ones and the porcelain ones and so on. I used to do all of it. When Caroline Goodfellow took early retirement about 10 or 11, years ago, I had to take on the whole doll collection as well as all my other things. The costume and the child care collections are pretty big on their own. I enjoyed doing it, but I’m getting towards the last part of my museum career, so I have to get some of my younger colleagues involved again. I’ve worked for the Victoria and Albert Museum since 1974. I loved dolls as a child—I still do—but I never thought I’d become a doll curator. Caroline, who was a consummate doll curator, actually disliked dolls as a child. But dolls get you. You can’t resist them, really. Some people don’t like them, and I find that quite strange. We’ve got a lovely wax baby doll from 1900 in mint condition. It was lying in a box on the table and someone said, “Take it away from me. I can’t bear dolls, and I certainly can’t bear wax dolls.” Oh, dear. They’re not that scary, are they? When I was a child, I collected dolls with costumes from different countries. Lots of people did then. If you knew somebody who was going to Spain, they’d bring you back a Spanish doll in a Spanish costume. All sorts of people like different kinds of dolls, and I think it’s just terrific that there are so many collections and collectors around. There have been so many different dolls in the last 50 years and so much marketing has gone into them, it’s almost impossible to keep up. That’s why I think a lot of people who collect dolls specialize. For example, Olivia Bristol at Christie’s is the president of the Doll Club of Great Britain. She told me that when she started working for Christie’s, everybody collected wax dolls, but then people got so frightened about how to preserve them that they started to go for the ceramic ones instead (most people who collect dolls collect ceramic dolls). But all dolls are breakable, even plastic ones. Collectors Weekly: When were wax dolls first made? Marshall: They started right at the end of 18th century. It’s hard for us to realize now just how shocking wax must’ve been for people who saw them for the first time. They tend to discolor and crack over time, but when they were new, wax dolls were much more lifelike than anything people were used to. Before that, there were only wooden or cloth dolls, and occasionally poor children made their own from odds and ends. They would put sticks together and make a doll-like thing. The poorer children would have to be more ingenious. They made them themselves, or their parents or older brothers did. If you didn’t come from a family with a lot of money and you didn’t live in a town, you’d be very much thrown back on your resources for playthings. 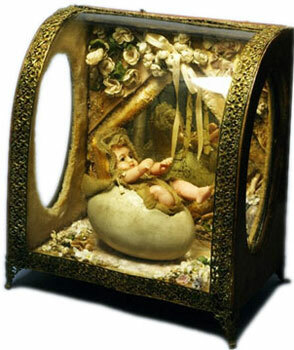 Dolls were often the main plaything for children, but there were also dolls that were kept as family relics. There’s a doll in this museum called the Old Pretender Doll. She was given by King James II or his son to a family who were loyal to the Stuart cause. That doll would probably never have been a plaything—it was preserved and revered because it came from the King. Collectors Weekly: Do a lot of people collect the 19th-century dolls? Marshall: Yes. That’s when dolls really took off because of mass-production. You had people like John Edwards who had a factory set up and turned out dolls in large numbers. Before that, if you were making wooden dolls, for example, they had to be turned and carved and painted, all fairly labor-intensive things and done in a workshop rather than a factory. Dolls were used to spread fashions. The 19th century was the age of industrialization with doll making. That’s when it started. Other people made dolls professionally before, but they couldn’t have turned out as many dolls as, say, Simon & Halbig would have. Simon & Halbig was one of the biggest firms in Germany, making its own dolls as well as ceramic doll heads for other doll manufacturers to their client’s specifications. Collectors Weekly: What do the numbers on the back of an antique doll mean? Marshall: One is its mold mark, the other is the size of the doll. The heads and bodies were usually made in two different places, so the numbers helped to match up the right sizes. The two pieces might have been made in the same factory but by different people. If you don’t join the correct head size to its corresponding body, the result looks extremely odd. Collectors Weekly: Were wax and ceramics the two major materials used for dolls in the 19th century? 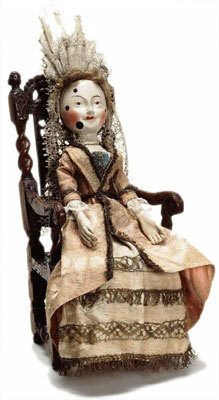 The Old Pretender Doll made about 1680. Said to have belonged to King James II at Holyroodhouse in Edinburg. Marshall: Yes, I’d say so. You still had some wooden dolls around, and you can’t necessarily say what people were using to make homemade dolls. There were still cloth dolls at that time, but they were often either made at home or made very cheaply. Into the 20th century, you get people making art craft dolls. Some of the German dolls from this period are almost like sculpture. There were still wax dolls around the 20th century as well. I can’t remember precisely when Frances Hodgson Burnett wrote A Little Princess, but the little girl in that classic childrens book had a wax doll. The Pierottis were still making dolls in the early 20th century, but I think in general by then most manufacturers were principally producing ceramic dolls rather than wax ones. And then there were new experimental materials like celluloid. Composition dolls started in the 19th century. They’re almost a byproduct of the wooden dolls. Although every manufacturer had its own recipe, the composition was made principally from wood pulp and mixed with things like plaster, egg shell, and other materials to give it a certain amount of shine. Although the composition is relatively unbreakable, it doesn’t always hold up over time—it often cracks. But if the composition recipe is produced just right, it is very tough, so a lot of people preferred to give young children composition dolls with cloth bodies. Collectors Weekly: Did the materials vary by region? Marshall: I think the Germans mostly used ceramics and the English mostly used wax, and then you’ve got the Americans and the Germans making composition dolls. There were ceramic dolls in England, too, but not so many. One of the things that did not vary much, at least at first, was doll design. For example, many of the people who were making dolls in the States were of German origin or were familiar with the German doll industry. You certainly have very distinctly American dolls like Izannah Walker’s, but I think it took a while for the mass production side to catch up. Some manufacturers’ dolls are more immediately identifiable than others, and some companies started in Germany before going to the States. Both countries were big enough to export, that was the thing. If you look at the French dolls’ high status and high price, you’ll see why they just couldn’t compete with the Germans in the end. The French made ceramic dolls at the same time as Germany, but never on the same scale and not as industrially. Also, the French dolls always had slightly more cachet. They were supposed to be posher and more expensive and better produced. They certainly had wonderful clothes, whereas I think many of the German dolls were sold either naked or wearing a chemise. The idea behind those German dolls was that the child learned to sew by making clothes for it (and of course it was more satisfying for a child to make a small dress for a doll than a big dress for herself because it took far less material and it was quicker). The French dolls were often sold with beautiful clothes. But that’s only in some cases. Generalizations are always a problem. Certainly once you’re into the late 19th and early 20th centuries, you get some very characteristically American dolls like the Kamkin dolls or the Martha Jenks Chase dolls. Collectors Weekly: Who were some of the major doll manufacturers during the 19th century? Marshall: The two biggest ones in Germany were definitely Armand Marseille and Simon & Halbig. They were bigger by far than anybody else. In France, you’ve got the Societé Francaise de Bébés et Jouets, or SFBJ, but that was really an amalgam of doll manufacturers trying to be economical. Jumeau and Bru are the two best known individual French makers. In England, there were a lot of different people making wax dolls. There was Lucy Peck, the Pierottis, and the Montanaris, to name just three firms. Collectors Weekly: Is it common for the wax dolls to survive? Marshall: Far more than you think. Although we tend to think of wax as a really fragile material, it can actually be quite tough. What it really can’t stand is huge variations in temperature. People always talk about the dangers of wax dolls and heat, but in fact they’re just as badly affected by great cold. If your wax doll is somewhere cold and the temperatures plunge overnight, that can crack the wax just as surely as being overheated can damage it. At least one manufacturer, Charles Marsh, made dolls that he said were suitable for the tropics. Putting them in front of the fire wouldn’t do them any good, but merely being in a hot climate wouldn’t necessarily melt the wax doll, especially if it were kept at a steady temperature. So yes, wax dolls are quite easily damaged in a way, but then so is just about everything else. That’s one of the things that’s been holy grail of doll manufacturing—the unbreakable doll. But that really doesn’t exist because even plastic dolls break, and in recent years, some of the soft vinyls in particular are decomposing and the dolls are starting to give off an ammonia kind of smell. Collectors Weekly: Were the features on antique dolls realistic? Marshall: They weren’t realistic to start with. They were a bit like portraiture. Portraiture is not always an exact science. It’s sometimes an impression of what the maker or painter thinks its subject ought to look like. Our Old Pretender doll, for instance, is not in proper proportions. Actually, proportions are something which are always skewed in dolls. They’re often quite unrealistic. They may have tiny feet and hands but very big heads. The most money went into producing the heads, so I think that was why they were often much bigger. The hands and feet on these dolls are so tiny that they wouldn’t be able to stand upright if they were real, but the feet didn’t matter, particularly when they’re wearing long dresses, so some were very crudely finished. Collectors Weekly: Did dolls have specific names? 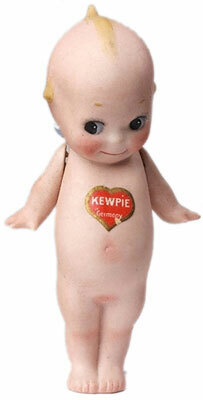 Kewpie Doll made by German manufacturer J.D. Kestner in 1930. Marshall: That started in the 19th century. Lots of manufacturers gave their dolls names like My Darling Baby, My Lovely Baby, My Baby, My Dream Baby. The My Dream Baby dolls were terribly popular and they made them in all sorts of different sizes. Then there were the mechanical dolls that really weren’t for children to play with. They were often for grown women as prestige objects or for families. A lot of them had china heads as well. Different countries made them, but mostly France. They would be mounted on a box and you would wind them up and they’d move. Some of them performed quite complex actions. Some of them would glide along the floors, sometimes raising their arms. We got a Lambert doll recently; she had lost her costume, so we were trying to work out what she could’ve worn by looking at her actions. It’s really quite difficult. They also made an incredibly complicated doll that represents a little girl trying to catch a butterfly. It shows you the butterfly moving and the doll trying to put the net down to catch it. And of course you had the decorative boudoir dolls. They wore fancy costumes and and were meant to be displayed on a bed. In the end, they often got played with by children, but initially they were just to sit on the bed and look decorative. There was a big revival of those dolls printed on cotton sheets in the 1960s and ’70s. Lots of craft shops sold the pattern for the doll and clothes printed out on a roll that you could make. Collectors Weekly: Could you tell me a bit about Kewpie? Marshall: Kewpie dolls were based on illustrations by Rose O’Neill in the Ladies’ Home Journal. They’re ceramic and they have Rose O’Neill’s name, usually on the feet. Of course there were a lot of imitations. Apparently the original Kewpies were produced by Borgfeldt, which was a New York company, and I think they were subsequently made by a German doll manufacturer called Kestner. Dolls like these were often treated as mascots. They sat on your bedroom shelf and looked cute. But some people did play with them. You just have to be a bit careful. The characterization of a Kewpie is this naked, cute child, so it’s slightly going against the character to put clothes on it, but of course little girls did dress them up and treated them as dolls in the ordinary way. The only bits that move are the arms, so they’re fairly solid. Collectors Weekly: What are some other doll types? Marshall: There was the multi-faced doll, which was a doll with a head that is molded with three faces. You just turned the head around to change the doll’s face. They were first made in wax, and then they progressed to ceramic and plastic. They look jolly bizarre if you take the bonnets off because part of the illusion depends on the far-forward bonnet to cover the rest of the faces. We’ve got wax dolls representing some of Queen Victoria’s children—one of Prince Albert Edwards, one of Prince Arthur, and one of Princess Louise. Madame Montanari specialized in those. And I think there are some dolls in collections from the States which are supposed to represent Martha Washington. There are also wizard dolls and gypsy dolls, just about any character you like. People can project anything they like onto a doll. Maybe that’s one of the reasons why they’re so popular. The bisque dolls come in during the second half of the 19th century. They eventually took over from the wax. For a long time, both were produced, but there were more of the china and ceramic ones. Certainly more survived. Collectors Weekly: How many dolls do you have in the collection at the museum? Wax Boy Doll made about 1860. Marshall: We figure it’s about 8,000. Some of them were dolls that were bought at auction. Some were bequeathed to us, sometimes from a collector, sometimes from somebody who wanted a good home for a treasured childhood playmate. We can’t possibly display them all. In fact, we had to reduce when we redid the displays in 2003 and 2006. We haven’t got as many dolls on display, but we’re about to redo things again so that there will be more. We’ve just redone our costume display, and I want to put more dolls in there. Many of them are on display for a long time and the light fades the clothes. Collectors are often interested in different maker’s dolls, so they would often prefer the dolls to be shown without clothes on, but the general public likes them best with clothes, so you have to try and satisfy both. Even though I am a curator, I would really hate it if all the good dolls were in museums. For example, I collect children’s books. One organization I used to belong to sent out a notice saying, “Your members must start willing and bequeathing their collections to museums and libraries or they won’t be preserved.” But at the same time, they were wondering how they could interest young people in collecting. So if we give out all of our collections to museums, there will be no books available for younger collectors to acquire. Same with the dolls. I think it’s brilliant that there are still so many fine ones out there. Collectors Weekly: How do people determine what type of dolls to collect? Marshall: Some of them are only interested in ceramic dolls. Others are only interested in American dolls. Some are only interested in dolls that represent famous people. Others might collect just one manufacturer. Some dolls are always going to be out of a collector’s reach unless they’ve got lots of money because they’re so scarce. Another problem is that people these days forge dolls, which is something that I’m sure nobody ever thought of 50 years ago. There was talk of a gang that was going around to museums and trade fairs and stealing dolls, not so much for the value of the dolls but so that they could replicate them exactly and pass off their copies as the real things. So there has been a certain amount of fakery. We have three wooden dolls called the School for Scandal dolls. We bought them thinking they were genuine 18th-century dolls, but they were made in the 1930s. Collectors Weekly: If a doll isn’t marked, how do you identify its maker? Marshall: If your doll doesn’t have a mark, you need to consider what it’s made of. If it’s a wax doll, it can’t be a Kamkin doll. Likewise, if it’s a cloth doll, it can’t be a Jules Steiner doll. There are manufacturers who cross over, like Kestner who went from bisque to celluloid for instance, but there aren’t that many. Most manufacturers are associated with one material. Collectors Weekly: If somebody is new to the world of dolls, what advice would you give them? Marshall: Collect what you like. If a thing doesn’t engage you but you buy it anyway for its potential value, it’s always much more possible that you’re going to be deceived and it’s not going to be quite what you think it is. If you want to collect dolls, use books and the Internet. Take advantage of all the wonderful color photographs that are out there so that you know what you’re looking at. Go around and look at sales and auctions. Even if you don’t want to bid, you can actually go and look at the dolls and handle them and talk to people. Look into the United Federation of Doll Clubs in the States and the Doll Club of Great Britain. They have websites and publications. Collectors Weekly: What are some good books about dolls? Marshall: I still think that the good books are very worth saving up for. One of my favorites is Mary Hillier’s The History of Wax Dolls. You think, “Well, this says copyright 1955. Surely somebody must have written another book since.” But this really is a great book. Caroline Goodfellow’s The Ultimate Doll Book is good, too, because she divides up the subject by materials. She does wooden dolls, composition dolls, poured wax, porcelain, bisque, and so on. It’s a very enjoyable book with lots of illustrations. The Coleman Collector’s Encyclopaedia of Dolls is great, too. Collectors Weekly: Is there anything else you’d like to say? Marshall: Dolls were used to spread fashions. I’ve even heard of dolls being used to smuggle intelligence in times of war. They’ve been around as long as we have, practically. I think dolls are sometimes a way for children to be in charge. I have heard people express anxiety that they don’t encourage affections, but I think they do. They’ve provided us with all sorts of usages throughout all the centuries, and people have derived a great deal of pleasure out of them. Ihank you so much for the information in this interview. It was wonderful for you to do it. So many people are so curious about these old dolls, their history and just doll developement in general. I do have a question, if you don’t mind? I have purchased a head recently and found the upper edges (she has no wig or pate)look much like the edges of the damaged foot of my mother’s AM doll’s paper mache body. This made me wonder when SFBJ started making paper-mache doll heads from the bisque molds? As a congomerlat were the paper-mache heads made by the same companies who made the paper-mache bodies? They were used to working with the materials. And I assume this move was in their quest for the “unbreakable doll”. Thank You for the nice and very informative article…In a nutshell. I have just become very interested in the history of and am making recreations of many old cloth dolls, like the Izannah Walkers, Columbians, Presbyterians, Maggie Bessies etc. It has been a wonderful pursuit which has taken me into so much history about American Cloth Dolls from the mid 19th century through the early 20th. I am also in love with the Deans Rag dolls and am always looking for more history on those. Are there any in the V&A Museum? Again, thank You for the nice article! I have a three face doll that has cloth body and breakable hands and feet. I am not a collector but have a new grandbaby and would like to perserve it for her. Can you give me any suggestions. I know I have had it for @26 years. to me Maribeth.. How I would love to have Noreen’s job and visit “The Old Pretender” whenever I liked. I hope to at least visit this amazing museum someday. I always look forward to articles such as this! So very informative, so thanks again! To Ms. Keane and Ms. Lewis: well-done journalistically. You asked questions of Ms. Marshall in a way that allowed her to open up even more as the article deepened. To Ms. Marshall: Thank you for getting to the heart of the matter where collecting antique dolls is concerned. It is true that new collectors should collect what they love. If you fall in love with a doll’s adorable glass eyes, crooked embroidered mouth or blushed bisque cheeks, that means so much more than scooping up antique dolls in the hope of higher appreciation in value in the future. Several years ago, while perusing a popular on-line auction site, I was drawn like a magnet to a tiny doll. She had intense, dark, glass eyes on an overall expressive face. I also loved her provincial costume, especially the tiny intricately designed hat that topped her hair, which comprise two large looped braids. I fiercely bid for that doll, not knowing whether she was late 19th c. or early 20th c., and not knowing whether she was German or French in origin. I won the doll and later had her professionally appraised. The appraiser, the profoundly missed doll surgeon Irving Chais of the New York Doll Hospital (now closed, due to Irving’s death in April 2009), had seen probably thousands of dolls since he had been in business. 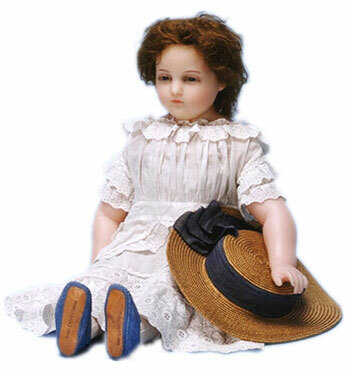 But when the good doctor looked at this tiny doll measuring 5 inches including her hat, he smiled as he gently held her in the palm of his hand and said she was in impeccable condition. He was moved, as I had been when I had opened the last layer of packing materials into which the seller — a reputable antiques dealer who uses that popular auction site to reach a larger market — had so carefully placed my doll. As it turned out, my cherished acquisition is a World War I-era doll, and her costume accurately represents the traditional dress of the Alsace-Lorraine region of France (once ruled by Germany). In fact, the doll is German-manufactured, and has the markings to prove it; the body is made of papier-mache and the head of bisque. She is all-original from her delicate hat and mohair wig to her painted-on shoes. Of all the antique dolls that I own, this tiny doll is one of my top three. has feathered eye brows, glass brown eyes, open mouth with teeth, jointed head to neck, elbows, hips, and knees. She is not in her original clothes but her body is in good condition…..Would you have any idea of her origin or her worth? Any info would be much appreciated. DEP Germany 6 1/2; the other is marked 79 over a 10 Germany Handwerck. Neither have eyes, their mouths are open with teeth, each has the feathered eyebrows neither has hair, but there is a woven covering for one of the dolls. There is a pair of eyeballs in the box. The third is a small boy’s porcelain head. He does have eyes. He is marked GOB Germany. I do not know how long he had them in the shop, but they are in great condition. Are there doll refurbishers who might be interested in these parts? has the original hair and would like to know what outfit she should have. I have a large baby doll filled with sawdust, maybe leaves or straw, and a spongy stuff, maybe cork. She has green glass eyes with short eyelashes. The legs look like they may have been leather or suede. The body looks like cloth. the arms are cloth and one arm is shorter than the other. a leather hand with painted fingernails is attached to one arm.Her head is composition and she has two big teeth and a tongue. Molded hair. There is a doll with the same head on ebay now but she has composition or plastic arms. There are no marks on her. Do you have any idea of the maker and her age? I’ve seen the doll head on many big baby dolls with cloth bodies. She weighs a ton and her body is a long triangular shape. I suspect she may have had composition arms and hands but don’t know where the leather hand came from. Any guesses are appreciated.Should I leave her alone or try to take her to a doll repair shop? Among my Mother’s things I found a large compo baby doll measuring about 29″,molded hair with a human hair wig lightly glued over it, sleep eyes with long hair lashes, two teeth and a tongue. Here’s the odd part: there is a winding mechanism on the right side of the body,a metal apparatus in her back, and 6 short metal cylinders with 2 holes in each. These cylinders have different children’s songs printed on them…are these music?? I am hesitant to insert them in the back. I can’t find any marks anywhere on the body or the head. Can you please help identify this doll? Thank you in advance for your help. I just recently purchased a pair of dols with wax heads, hands and feet and cloth bodies. They are an elderly couple, each sitting in a chair. They both are wearing spectacles and, I believe, are quite charming. Unfortunately, they are both in their “underwear” and without clothes other than their shoes. He is primarily bald – she has blonde braids wrapped around her head. I am so curious to know their place and date of origin – and for whom they were made — what “market” I mean. Value also is of interest to me, though I suspect the fact that they’re without cloths and that she’s lost a hand is quite detrimental. Their faces are amazingly lifelike and detailed, however, and without damage. Thanks for helping me get some information regarding this old couple! Hi, I inherited a lovely old Boudois doll from my Mother when she passed on. My Mother was 91 and she and her sister who lived to 102 received each a Boudois Doll from their Father, (My Grandfather) 1 boudois doll each. These dolls were brought home from France by my Grandfather after he fought in WWI, as well as WWII. I have one of the dolls, the other went to another niece in Canada. I would like to have more information on the dolls, and treasure this doll with my heart. If you can forward any information to me regarding these dolls, and where I could possibly see anymore of them either on line or elsewhere I would be grateful. I would also be interested in where I could buy accessories or parts for these dolls. I really have a wonderful treasure to care for. A friend gave me a doll that is cloth-maybe stuffed with straw. Stamped Poland on the left leg (black ink). Plastic face, painted features. Coth black shoes with yellow/gold ties. Orange skirt with two green buttons on the waist and black shirt with orange short shawl with lace where it meets in the front. Long orangey hair page boy style. KNow his father got it when he was in Navy about 1945 ish. In great condition. Can you tell me anything about this dolls or dolls like it please. Thank you very much. Would it be worth much as a collectible? An elderly friend (86 years old) has a Princess Louise doll that was her Mother’s. Beautiful face. I was wondering what the value might be and what the original clothes looked like. I also have a 1935 Shirley Temple 13″ doll and would love to have it retored. Can you recommend someone? My brother gave it to me when I was a little girl. I purchased 2, 4 1/2 inch Kewpie dolls at a garage sale for 1 dollar. One of them is fully clothed in a little tux and top hat. The other is holding a bouqet of flowers and is wearing a yellow toule sundress. It looks like they were put on these little wooden stands by the original owner so they could stand upright. On the bottom of each stand it says “April 25th 1926 5 p.m. They both have the arms that are connected with the thin ropes and the little girl has the blue wings. I can’t see the little boy’s wings because he has the tux on. I believe it is the bisque. Her little eyebrows look more like little dots rather the the shape of the one you are showing in your website. otherwise she looks exactly like the one shown in your site except for the clothing and flowers. Just trying to find how much they would be worth. Is there any sure way you can check a antique doll to make sure it isn’t a reproduction? I purchased a very high end doll, and I was just wondering. I know you can use a black light, but is there any other way? Noreen, are you still at Bethnal Green? It’s Penne Smith (Christie’s Ed, 1989, plus Bethnal Green intern for moving all those children’s books) in the US, saying hello! Very interesting article on dolls, will share with colleagues. My mum has an original Martha Washington China dolla, still in the glass it came in at leat 65y ears ago. Am trying to find out any value to it. thankyou, anything would help she is now 80 and getting ready to clean things out. I have an Armand Marseille Bisque Headed Dream Baby Doll – A.M. Germany 351/7K 18″. Have just had the doll restrung but cannot find any clothes, e.g. cap and dress, to fit her or anybody to make them, can you please advise on this? I understand they were originally sold undressed or wearing only a thin cotton shift or under garment. I have a doll, she has a bisque face and body, arms, legs move. she is at least 80 yrs old, and has human hair, would like to know if this is a form of a kuppie doll she looks simular. now shes starting to fall apart. i wouls also like to know if theres any value in this condition. ty. Question. A molded hair shoulder head (about 1910-1920) that I just broke into bits. Head is 1- 1/8 diameter on body that is about 14 inches tall. Head thickness is very thin and light beige color inside and out. What material is this made of, I want to know what I am looking for to search for a replacement head. Is there anyine I contact in the UK when I was very young my Aunt worked in a toy shop that stocked new Gotz dolls and my mum with the help of my aunts duscount bought me melody ann she is a vinyl doll with a soft body and clock work. When wound she plays a lullaby and wriggles. I was allowed to take her out if her b I x a wind her have a cuddle and then she went back in the box. She is as she was 40 years ago and so is the box. I am unable in the net to find another doll. In 1975 I received a pair or “old couple” dolls from my cousin as a wedding gift in New Orleans. I presume he found them in New Orleans, since that was where our family lived and it is unlikely that he found them elsewhere. The realistic faces of the man and woman are carved wax, and they are fully dressed in an old-fashioned style and seated in simple straight backed wooden chairs. How can I find out something about these dolls? I live in Houston, Texas but grew up in New Orleans. Thank you. “ ” That’s the Renaissance spirit—it’s not just about ingenuity and innovation, but a respect for the past.